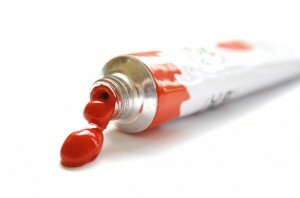 Acrylic paint, when compared with other mediums like oil paint, is a fairly new addition to the world of painting. It has only been around since the 1950’s . It has been continually under development and refinement since that time. Just because acrylic paint has not been around as long as oils, does not make these paints less important or enjoyable. Some of the wonderful benefits of using acrylic paints are their versatility, permanence and ease of use. These paints can be applied thickly as an impasto or in thin washes similar to watercolor. Acrylic paint does not yellow or harden with age like oils. 1) The paint will not remain workable for very long, so you have to work fast. 2) Brushes can be ruined if you do not clean them right away. 3) If you plan to paint outdoors, then acrylic paint is probably not the best medium to use, especially on a hot sunny day. When you lay out your colors on a palette or other surface, they will begin to dry quickly forming skins on the surface, making them quite difficult to work with. Many artists like to use acrylics in a fluid state, similar to watercolor. There is a notable difference though. With acrylics, washes can be layered on top of one another without fear of disturbing the colors underneath. You must wait for one layer to dry completely before applying another of course. Once each layer dries it becomes insoluble in water. One disadvantage to using acrylics as a watercolor medium is the difficulty in modifying the color. Once acrylic paint begins to dry it becomes very difficult to modify and washes can sometime dry with unwanted hard edges. You can avoid this problem in one of two ways. You can either dampen the paper before the paint is applied or you can use an additional brush dampened with water. Use one brush to apply the paint and immediately soften the edge with the other brush that has been dampened with the water. This technique was made popular by the master painter Jackson Pollock in the late 1940’s and early 1950’s. You use a very fluid acrylic paint for this technique. You can pour it directly on the canvas or dip a brush into the paint and let it drip down onto the canvas. You can create some very interesting effects with this technique. Check out Jackson Pollocks work to see this technique in action. Sgraffito is a scratching technique. It got its name from the Italian word graffiare which literally means to scratch. Just as the name implies it involves scratching into the surface of the wet paint which reveals either the ground or layer of dry color underneath. There are a number of different tools that can be used for this technique. Tools like screwdrivers or the sharpened end of an old paintbrush handle can work. A regular squeegee that you can buy at any hardware or auto store has the ability to create some interesting effects. First squeeze out some paint blobs directly along one edge of your support. You can layout whatever colors you wish. Then with one fluid motion drag the paint across the surface with your squeegee smearing and mixing the paint as you go. One of the things that makes a painting interesting is variety. Use a variety of different brushstrokes, techniques and values in your paintings. Change the direction of your brushstrokes or mix different techniques in the same painting. Don’t copy other artists. Allow other artists to influence you and paint your own impression of what you see from your heart and soul. This is how your inner creativity shines on the canvas. It is what set painters like Vincent van Gogh and Salvador Dali apart from the rest. They each injected their own style and heart into their work. Spend time observing and studying your subjects and surroundings. Landscape artists spend a great deal of time outdoors studying nature. Figure and portrait artists spend a great deal of time studying the human anatomy. If you aren’t spending enough time observing the subjects that you wish to paint, then you won’t have the necessary knowledge to paint them. Are you using quality acrylic painting supplies? In the beginning when you are experimenting, it is ok to use cheaper supplies, but as you become more experienced, you may want to consider investing in better quality. When it comes to fine art supplies, you usually get what you pay for. If you buy cheap brushes, they will more than likely begin to fall apart. The ferrule of the brush can loosen and the hairs can fall out. If you use cheap paint, you will get cheap looking results. The colors will not have the same brilliance or the right consistency. Lets face it, good paint does not come cheap, so in an effort to conserve our paint, some artists will use as little paint as possible. This is a reasonable concern, but the truth however, is that your paintings will be more interesting if you lay down the brush stroke, leave it alone, and then reload your brush. Don’t try and scrub the paint into the canvas, otherwise you are just staining, and not painting. Don’t overly criticize or judge your own work while you are painting. This will discourage and frustrate you. Just relax and let go. Trust yourself and your abilities. Tell me what to do?? please i need help! The pictures and ideas fight in my mind, but I am scared to draw them.. I think I am scared of ppl around me, dey might misunderstood me..
Also, I have not enough home to keep my accessories safe from my younger brother.. give me idea, should I hide my paint kits and brushes under my bed?? or to dig them in lawn :s ..
.-= Warroya´s last blog ..RE-MEMEBER NEVER FORGET =-. Great tips! I love acrylics because they are so versatile and the clean-up is so easy! .-= Miranda´s last blog ..Portrait Giveaway – Work in Progress 2 =-. I have to say I’m still a big fan of watercolor painting and like the fact it’s more eco-friendly. In college I even experimented with creating paints out of natural juices such as beet juice and carrot juice! Try it out! Beginners”, very compelling and it was in fact a remarkable read.